Autism and the extended family is a book with an unusual feel to it. In fact, it's opening chapters felt so different that I was initially wondering if I would like the book. As it turns out, the language is completely appropriate and it is a good book. It's just that being as close to autism as I am, I'm not in the target audience. Where most autism books jump right in and talk about the details of autism from the inside, this book remains firmly outside the circle, keeping the outsider’s viewpoint. To be honest, the opening chapters reminded me a lot of “Autism speaks” literature but don't worry, it gets a lot better from there. The book is trying to speak to outsiders and it needs to use concepts that they can understand. This book talks about high functioning individuals but it feels much more like a book for families with more difficult and more "hands on" forms of autism. The book starts with a "welcome to my world" chapter, I can't tell you how many times have I my wife utter that particular phrase to extended family member. Following this is a section on grief, particularly grief following an initial diagnosis. This chapter walks you through how each of the stages may present in different individuals with good advice and cautions on what to say and what not to say. Other chapters cover Grandparents, making particular note that their frailty can often preclude their direct involvement with very active children with autism but at the same time making it very clear how they can support their families. For example, via financial assistance or by taking a grandchild without autism out to allow the parents to concentrate on the child who needs more attention. There are chapters which cover siblings from various points of view including; how outsiders can interact with siblings to reduce sibling rivalries or jealousies. Older sibling relationships are also explored, particularly aunts and uncles who may need to help out their adult brothers and sisters when dealing with a child with autism gets too much for them. Other parts of the book cover step-families and blended families, close friends and cousins. The book closes with a chapter on holidays, covering sensory overload, careful decorating, minimising noise and smells and providing safe areas for individuals with autism. All things considered, “Autism and the Extended Family” does exactly what it says on the cover, it provides a good guide for people outside the immediate family, to help them to understand what is going on and how they can help. At 125 easy-to-read pages, full of great case examples, it's short enough to read cover to cover in a couple of hours. If someone in your extended family has just been diagnosed with autism, this is the book to get - for yourself, not for them. There are many better books on autism which are more suitable for parents and people with autism but this is probably the best resource for members of the extended family. 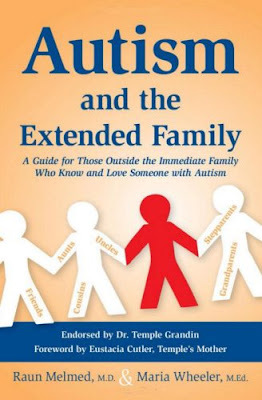 Autism and the Extended Family: A Guide for those Outside the Immediate Family who know and love Someone with Autism by Raun Melmed M.D. & Maria Wheeler M.Ed Is available from Future Horizons, Amazon, Barnes and Noble and the Book Depository. Honestly clause; I was provided with a copy of this book free of charge for review purposes.